I have a lambda 1 analog input and also an aem wideband gauge. Two of them are showing different values up to 2:1 afr points sometimes. Car was tuned according to lambda 1. As we don't know if lambda 1 is oem narrowband or wideband is there a way to justify it from ecu or somewhere? I've seen values down to 9:1 on lambda 1 if there is a max/min for a band. If it's an oem sensor does it mean that car needs to retuned according to aem wideband? There are two censors on the pipeline. The upper is lambda 1 and the latter one is aem wideband. In ecu i was able to find just one lambda meaning that the other one is not wired to ecu. Aem UEGO Analoge widband is junk. The never ready up the same as my reference lambda on the dyno. I highly recommend the Link CAN-Lambda. They read very accurate. 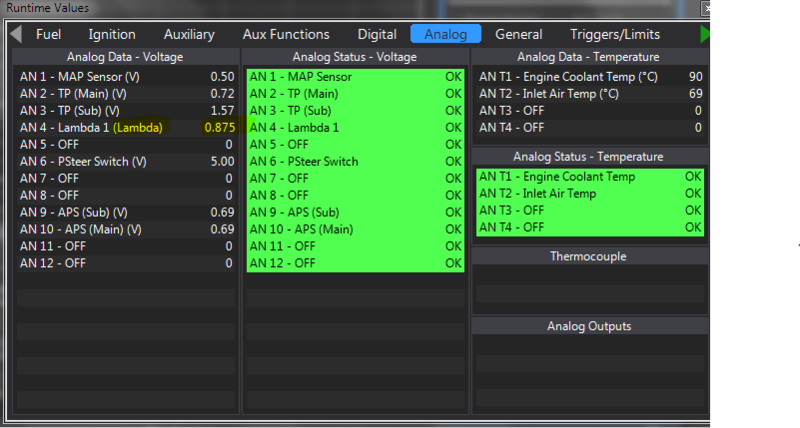 Note there is no "lambda 1" set up by default, it will not be coming from a factory narrowband or wideband sensor, if you have a working Lambda 1 displayed in PC Link then it probably means your AEM device is connected to the ECU. Can you attach your tune file (.pclr) and also tell us what model your AEM device is so we can check your settings. Here is the base map. We have altered the tuning according to aem wide band gauge and it's much better now. I suppose lambda 1 connected to ecu is the oem lambda as it's always richer than aem. I also could not verify calibration settings of aem uego in ecu. I also wish aem wideband was wired but it doesn't seem so. I suppose lambda 1 connected to ecu is the oem lambda as it's always richer than aem. No, as I already said the factory sensor cant be used for lambda 1. You have Lambda 1 assigned to AN Volt 4, this is normally the tumble valve position on a V10 subaru so somebody must have wired something to the ECU. 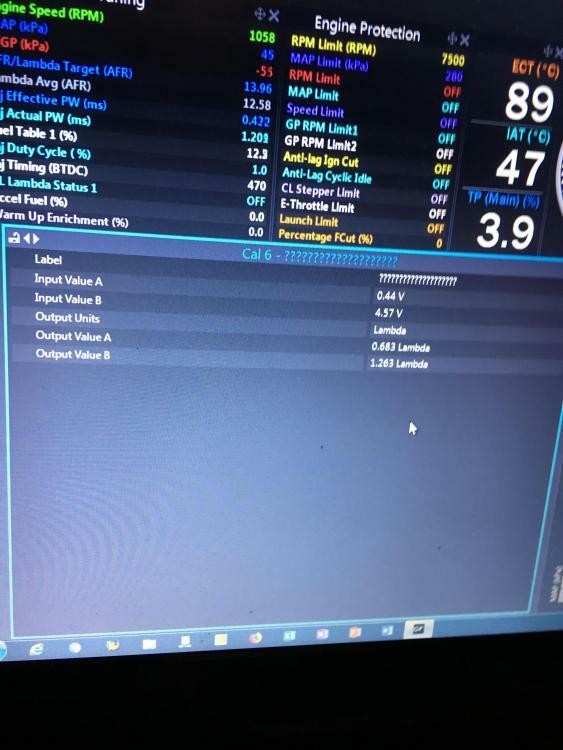 You have a very weird calibration on AN Volt 4 that matches no wideband controller that I know of so thats most likely why it doesnt read right. If the AEM is the only wideband you have fitted to the car then Im pretty sure the AEM must be wired to the ECU, to test if it is, with PC Link connected to the ECU so you can see Lambda 1 in the software, with engine not running, can you unplug the wires out of the back of the AEM gauge and see if lambda 1 reading in the software changes. back of the gauge was siliconed due to socket problem and it's on a very hard place to unplug. for an easier one is it ok to change calibration according to aem and check if it's almost matching with gauge? You can try that. To give you an example calibration I need the model number of your AEM gauge as there are at least 3 different AEM wideband gauge calibrations in use. OK. that's a hard question for the reason i mentioned. but i strongly believe it's a 30-4100 most common one around. is there a document that i can check the calibration numbers for the other models in case i'm wrong? Edit; updated, posted wrong pic originally. i will check when possible and let you know. I dont know why but they are not matching. The closest values I got are when calibration is 0.685 and 1.235. I doubt this belongst to any product. do you have the info on other calibration values in order to try? icouldnot find them online. Temporarily change the AN Volt 4 function from "lambda 1" to "voltage 0-5V", so we can then view the raw voltage coming from the device in the runtimes screen while we do the test. Runtimes screen is accessed by pressing F12 on the keyboard and then go to the analog tab as per the picture below. Pull the sensor out of the exhaust system. With power on and the sensor hanging in free air, note down on a piece of paper both the voltage displayed in the runtimes screen and the AFR or lambda displayed on the gauge face. Next slightly dampen a rag with some hydrocarbon solvent (petrol or brake clean will do) wrap that rag around the sensor so the damp bit is near the sensor tip, the gauge should go to full rich scale as the solvent evaporates. Again note down the voltage displayed in the runtimes screen and the value displayed on the gauge face. Report back what you have recorded and we can build a calibration from that assuming the values we get back make sense. one comment: i suppose gauges have down and upper limits. for example if it's 9:1 it would show 10:1 as a minimum. and after 18:1 it turns to "---" as far as i know. wouldn't it effect calibration? strange thing is that i see the lambda unit in runtime values rather than voltage. i was not able to change it. i think i cannot calibrate under these conditions. sorry i couldn't quite follow. if it's linear then max 4.99 volts would mean 1.96 lambda which is huge. how can i use this info for calibration? The problem is AEM have at least 3 different calibration curves and the OP doesn’t know what model gauge he has. I will try to apply the test soon but is this a restriction: minimum/maximum afr that we can read from gauge will be 10 and 18.5. Is it worth to try anyway since I assume that the sensor is welded to mount from heating up and cooling down for year maybe more and I don't want to break it for this test. Correct me if I'm wrong though. I will try to apply the test soon but is this a restriction: minimum/maximum afr that we can read from gauge will be 10 and 18.5. This is what we want. We want to know what voltage the ECU receives when the gauge reads full scale and minimum scale. Here are the results of the test. I still see small differences which are smaller than 1:1 afr but its the maximum point we can reach then. wasn't it supposed to be matching one to one almost? would it be some grounding problem then? maybe i should try a closed loop lambda and compare it with the gauge. It is not clear what you have done or what your problem is? Did you do the test I suggested by removing the sensor and checking the voltage at full rich/full lean? Is that the results you show in the cal table above? what did the gauge read and what where the voltages? Can you give some examples of what the gauge displays VS what the ECU displays with the current settings.